This will conclude my three day run of Matthew Melton related 7"s released on Southpaw records. 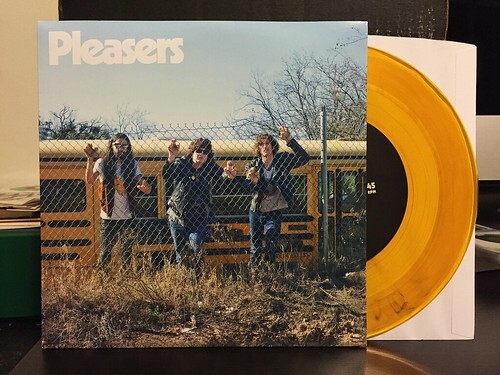 I have saved the best for last as this Pleasers 7" is miles better than the other two. That being said, I don't completely understand why Melton formed another band that for all intents and purposes sound pretty much exactly like Warm Soda. If Warm Soda broke up, I could understand, but I'm a bit confused as to why he needs two bands that sound like this (and a solo record that only strays slightly from the formula). I'm not going to get too worked up about it as both songs on this 7" are quite good. A-side "Reject Teen" spins a yarn about not fitting in during high school and some of the hijinks gotten into. It's a bit goofy, lyrically, but the song is saved by a super catchy vocal melody and some good lead guitar work. The thing that most reminds me of Warn Soda is the same type of click track style drumming and what ever they do while recording to make the snare drum sound like it was plucked from a 1986 Boogie Down Productions album. On the flip is "Judy." It's slightly lower key in nature, but just as easily stuck in your head. The highlight being the way the pre-chorus gradually builds into the simple but ultra catchy hook. Of the two songs I probably prefer "Judy," but both are excellent and could easily work their way on to a Warm Soda full length and fit right in. Of the three 7"s I've reviewed this week, this one is the one I most recommend picking up. That's going to wrap up this week as tomorrow is Thanksgiving. I'll be back on Monday, but don't forget that PopKid records is having a black Friday sale at http://www.popkid.com. Help me clear out some of these old records and make room for a new LP coming in 2016.